Pothys Silks Showroom in Trivandrum is situated next to Bhima Jewellery near Ayurveda College Junction, MG Road, Trivandrum, Kerala. Pothys, dubbed as the Aalayam of Silks, has a great tradidion in silk, spanning more than 4 generations. 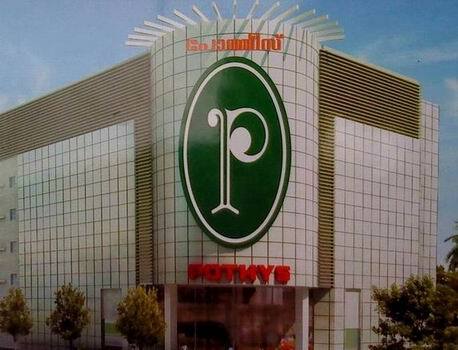 Other branches of Pothys are in Srivilliputhur, Tirunelveli, Chennai, Madurai and Coimbatore. This is the first showroom of Pothys outside Tamil Nadu. Pothys Showroom in Thiruvananthapuram was inaugurated by Superstar Mammootty on 15th September 2011. The new Pothys Trivandrum showroom is one of the biggest shopping malls in Thiruvananthapuram with 2 lakh square feet shopping area. The new shopping complex features all kinds of garmnents from wedding sarees to churidars, Children’s Ready Mades, mobile phones, watches and fashion jewellery. Lower Ground Floor – Fruits and Vegetables, Groceries, Provisions, Diary Products and other Super Market Items.